Cycle-Moore Motorcycle Campgrounds and Independent Motorcycle Shop, Interlochen, Michigan. Plan your motorcycle trip to Cycle-Moore motorcycle campground in the heart of Northern Michigan in gorgeous Interlochen, Michigan, near Traverse City, MI. Camp alone or as a family, or bring your group. Call for special family rates. CAMPGROUND IN NORTHERN, MICHIGAN We offer wholesome family camping in the heart of Northern Michigan. Host your own rally, or we will be glad to cater it for you. Various cooking and serving equipment is available for your use under our pavilion. There are fire pits, picnic tables, clean bathrooms with hot, hot water and showers, as well as on-site wood for sale. Many of our sites have electrical hookups for your camper, RV, or other needs. 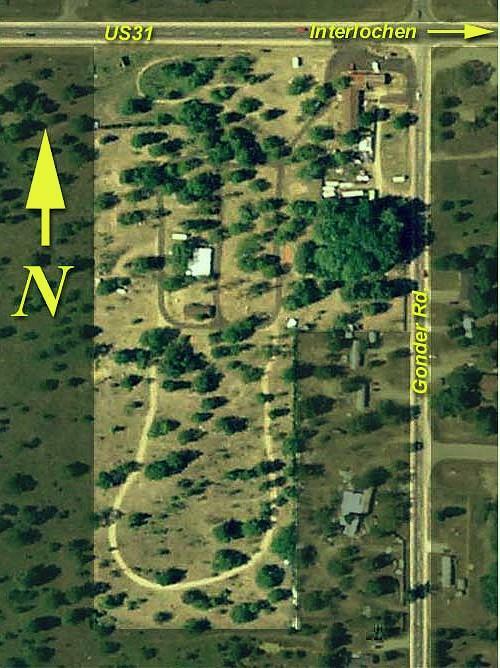 Our motorcycle campground has plenty of room for your tent, camper, fifth-wheel, RV or motor home. No matter how big the motorcycle event, or your rig, you can count on having room for your needs. Bring the family, bring the trailer, bring every motorcycle you own, bring the entire group... we will always have enough room. And best of all, no reservations are required except for closed gate events. Just show up and plan on some great motorcycle riding and a great time! Come to Northern Michigan and join us at Cycle-Moore in Interlochen, Michigan, near Traverse City, MI. Cycle-Moore's motorcycle campground has been in operation since the '70's. People come from all over the United States and Canada to visit our motorcycle campground every year, and find our motorcycle campground and the people that operate it and frequent it to be the best in the business. If you are looking for a motorcycle campground, you can not go wrong with the Cycle-Moore Motorcycle Campgrounds. Motorcyclists, we're for you .... we want you .... we prefer you .... and will take good care of you!!!!!!!!!!!!!!!!!!!!!!!!!!! Our motorcycle campgrounds include the following amenities: COMING IN 2016 THE PIT STOP .... WHERE YOU CAN PLAY OLD TIME SHUFFLE BOARD AND SHOOT POOL .... FREE OF CHARGE .... LOCATED IN THE SHOP BUILDING BETWEEN THE REPAIR SHOP AREA AND THE ORIGINAL MUSEUM ROOM OR JUST HANG OUT AND SHOOT THE BREEZE!!!!!!!!!!! Northern Michigan's Oldest Motorcycle Campground! So when you plan your motorcycle trip to Cycle-Moore motorcycle campground in the heart of Northern Michigan in gorgeous Interlochen, Michigan, near Traverse City, MIchigan .... remember that there is a motorcycle campground just waiting for you!!!!!!!!!! Cycle-Moore motorcycle campgrounds offer wholesome, inexpensive family camping in the heart of beautiful Northern Michigan. You can host your own rally, or we will be glad to cater it for you. Various cooking and serving equipment is available for your use under our pavilion. There are fire pits, picnic tables, clean bathrooms with hot, hot water and showers, as well as on-site wood for sale. Many of our motorcycle campground sites have electrical hookups for your camper, RV, or other needs. If you are looking for a motorcycle campground, rv campgounds, or a place to host your Michigan Motorcycle Rally, our motorcycle campground is exactly what you are looking for. 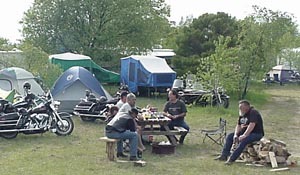 Our motorcycle campground has plenty of room for your tent, camper, fifth-wheel, RV or motorhome. No matter how big the motorcycle event, or your rig, you can count on our Cycle-Moore motorcycle campground to have room for your needs. Bring the family, bring the trailer, bring every motorcycle you own, bring the entire group... we will always have enough room. And best of all, no reservations are required except for holidays. Just show up and plan on some great motorcycle riding and a great time! Come to Northern Michigan and join us at Cycle-Moore in Interlochen, Michigan, near Traverse City, MI.